The parang nabur is a type of Indonesian saber that is peculiar to the southern part of the island of Borneo. It was primarily used by Malays living in that part of the island, during the Sultanate of Banjar. But there is evidence that shows some also ended up in the hands of Dayak chieftains, probably through trade. 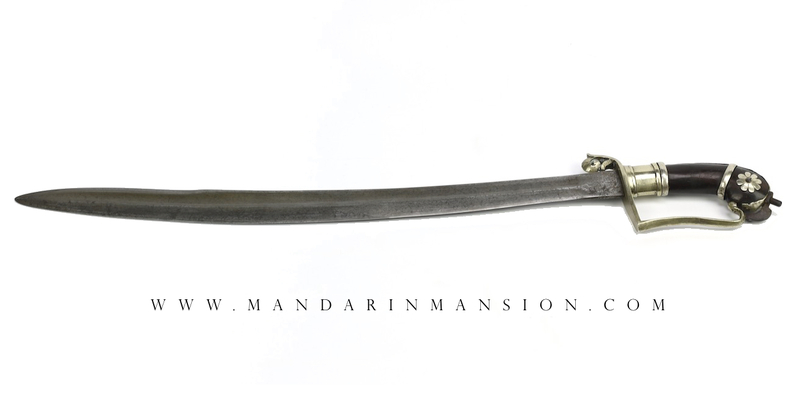 While collectors in the English speaking world mostly know the weapon as parang nabur in following of Stone's Glossary, it is locally known as beladah or belabang .1 It combines a Indo-Islamic curved saber blade, often with a sharp backedge, with a handle that is strongly inspired by Dutch naval cutlasses. 1. George Cameron Stone; Donald J. LaRocca; A Glossary of The Construction, Decoration and Use of Arms and Armor: In All Countries and In All Times. Courier Dover Publications, 1999. Page 482. Materials: Steel, baitong ("German silver"), horn. The curved blade widens near the tip, which is partially double edged. There is a wide, shallow groove on each side. Its base is narrow but thick for rigidity. It's substantial and well-balanced. 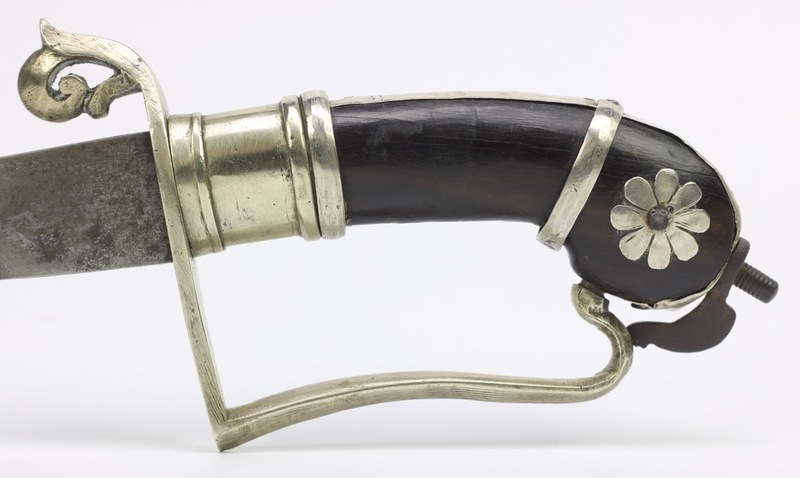 The handle, of typical form for these, consists of a horn grip mounted with baitong or "German silver". This material is an alloy of copper, nickel and zinc that is thought to have been used by the Chinese as early as the 10th century A.D. where initially the alloy was found Yunnan.1 The Chinese have sold ingots of the material to European traders since 1597, until they figured out how to make it themselves in the 18th century.2 After this time, it was commonly known as "German silver". So despite this name, the material is most likely an import from China, who had trading posts on the island since as early as 500 A.D. The handle features the characteristic knucklebow which was inspired on Dutch naval cutlasses. It's of a type known as "stirrup hilt" in English. The rear prong terminates in an attractive and more typical Indonesian curled design. 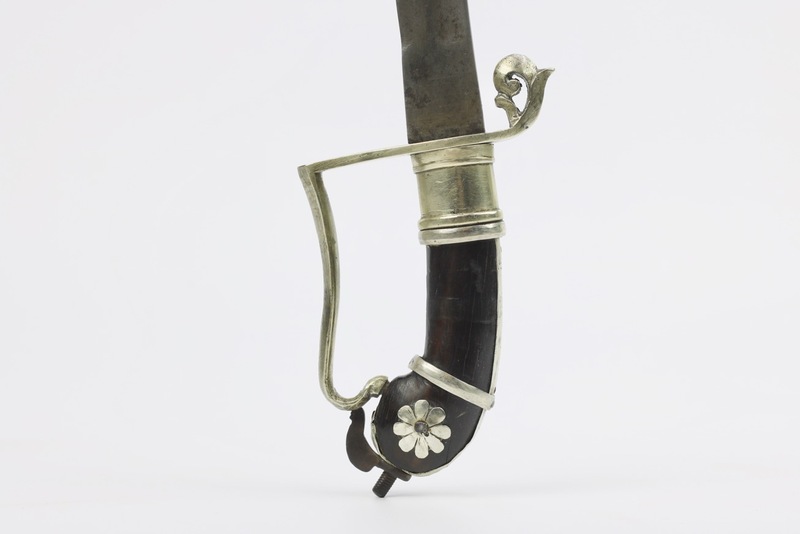 The hilt features a thick ferrule, an extra band, and additional flower-shaped ornamental plates. The rear and back of the handle is also lined with baitong sheet. The pommel end is secured with an iron wing nut on a threaded tang. All is tight, save for some movement in the flower shaped ornaments and the lower silver band. A nice representative example of a rare Indonesian sword, that shows the cross-cultural influences in the area. Favorably priced, because favorably obtained. 1. Joseph Needham: Science and Civilisation in China, Vol 5-22: Chemistry and Chemical Technology, page 190.